On July 25, officers with the Vandalia Police Department took a report of fraud in the area of the 600 block of W. Home St. The reporting party had paid for services from an asphalt paving company who had been going door-to-door soliciting sales. Officers arrived on scene and measured and photographed the job site. The reporting party had attempted to make contact with the company again as the services written in the contract were allegedly not delivered. 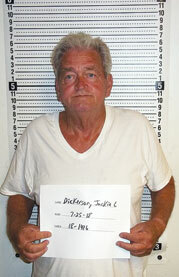 Officers made contact with Jackie Dickerson, 67, Miami, Okla. in reference to this case and made an arrest of the subject. Dickerson had several prior convictions for stealing and deceptive business practices. He was transported to the Vandalia Police Department for processing pending charges of stealing, failure to register motor vehicle, financial exploitation of the elderly, and deceptive business practice. Dickerson was then transported to the Audrain County Jail.